'All Creatures Welcome' is what the sign would say if Kris Green had one inviting passersby into her garden. 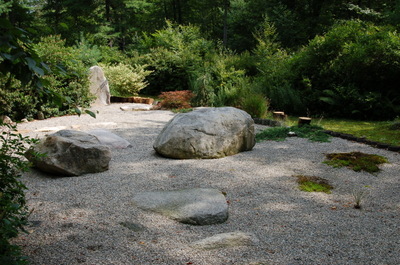 The chairs sit empty but inviting in the center of the garden. They are begging for a rump or two to sit and survey the quiet complexity of this verdant space. There is the resident pup, Nino, seen here surveying the kingdom and then there is the pollinator condo Kris has devised to provide an invitation to visit and a bit of security for nature's winged critters. I imagine some crawlers lodge here as well. All are invited. Kris is a fellow blogger, an Interpretive Horticulturist at Blithewold and a friend and this past summer I was invited to visit her garden in Bristol, RI. Now, we both live in the same state and the smallest state at that but Bristol is right on the ocean and my garden sits in the western hills a full zone colder than Kris's garden. That is one reason it is such a fun to visit. She easily grows this Clerodendron shrub which would succumb to cold in my garden. (Perhaps I should give it a try.) There are other treats as well. Monarda punctata adds subtle color and wonderful form to the front border. Kris has a creative eye along with busy hands making a small but sensory packed jewel of a garden. She has an artist's eye as evidenced by her clear mastery of texture and color. 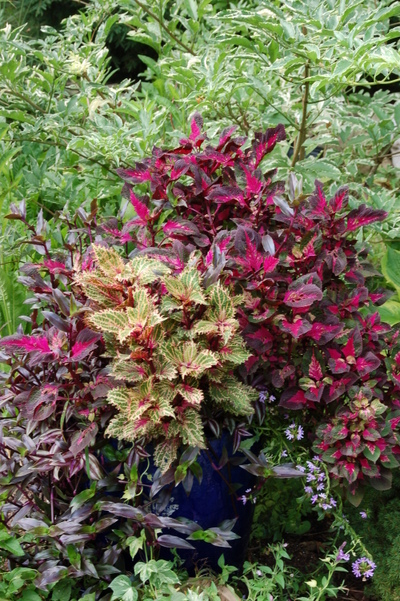 The echo combination of agastache and cleome is just one example. She knows full well that August can be a tired time in the garden and she has embraced the nuances of lace and leather here in the borders. If you happen to sit in the chairs, there is a lovely view of the deck complete with perfectly potted plants and upon entering the house, it is clear that an artist and gardener lives inside. The living room even has a living wall. 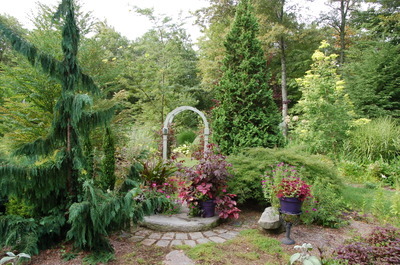 Kris was born with her unique perspective which she has honed in life along with her horticultural skills. She works in the greenhouse and gardens at Blithewold Mansion and Gardens and she writes their blog with wit and wisdom and always a quick turn of phrase which you can read here. We can all look forward to more of Kris's writings as she is completing work on a new book, the contents of which remain a mystery. Due out in the fall, it promises to be filled with a fresh approach to the age old art of gardening. While Kris is never in anyones shadow, she prefers to keep a low profile but should you stop in at Blithewold, take the time to talk with Kris and also with Gail, Dan and Fred. You will recognize her from her smiling picture above and here standing just behind and to the right of the enigmatic and always interesting Michael Dirr. Thank you to Kris for a lovely day in her garden with her, Nino and the critters. has lived and worked in China and is a supreme hostess. Heath, MA and Pat's garden is a good two and a half hour ride from my RI garden but the trip was glorious and I was kept company by my Mom who loves a good ride and change of scenery. We first visited Elsa's garden which you can read about here and then Pat escorted us to her garden. We drove six or seven miles along winding rural roads until we reached the final turn to Pat's garden which is at the end of at least two miles of rarely traveled road. How do I know this? The grass was growing up the middle of the tract to her house. This I envy although she has the best of both worlds since the town does maintain the road which ends at her house. She may be at the end of the line but it is the most glorious end of the line I have ever witnessed. 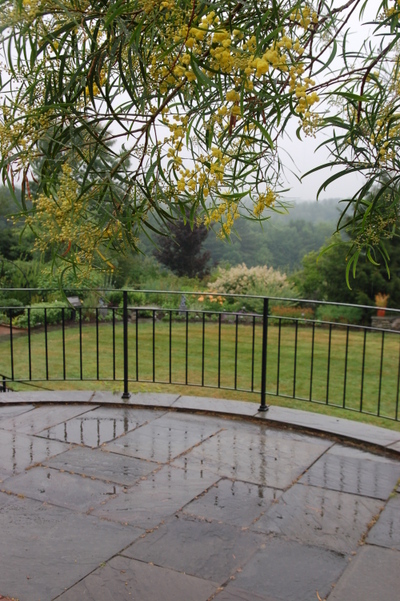 Picture a sunny hillside with farmhouse overlooking gardens, fields, woods and the far hills. I wandered the gardens while Pat puttered in the kitchen and chatted with Mom. It is nice to have a tour but it is also nice to absorb the efforts and inspiration of another's garden. The house has a delightful patio with wisteria covered pergola and an herb garden just in front. Walking across the drive and past the old barn foundation, the rose border beckons. Many of the roses are done blooming for the season but a gardener's imagination knows no limit and the scent was as real as if it were actually in the air. The rose walk heads down to the new potager with blooming flowers and vegetables. 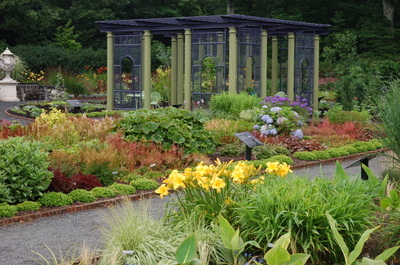 The screen house sits overlooking the field and just in front, on the way back to the house, the crescent shaped beds of perennials, shrubs and trees provide color and interest. Did I forget to mention the apple trees along the potager? I have to confess I plucked one for an early treat. Pat has a welcoming home with bookshelves filled to overflowing with cookbooks. To our delight and surprise, the table was set and we had a lovely lunch in the light of the sun filled table in front of the window overlooking the garden and beyond. How could biscuits taste so lovely? Just as appetizing were the farm raised, marigold yolked eggs in fritatta form with berry buckle to follow completing the meal. Simple, elegant and very delicious. It is a meal I will long remember shared with Mom and Pat overlooking a beautiful garden. Our day did not end here as Pat graciously took us down the mountain to the city of Shelburne to view the Bridge of Flowers. That is a post for another day though. Blogging has enriched so many of our lives by opening worlds beyond our own. Every opportunity to meet a fellow garden blogger and to actually see their garden is a great gift. Many thanks to Pat. I am hoping she will take the drive down to visit my garden when she has the time. Tucker, Cooper and I are here waiting for you, Pat. Thanks to all for taking the tour with us. Have you visited a garden blogger this year? Who, when and how about the next one on the list. Share! Went to a garden party last night. What fun! 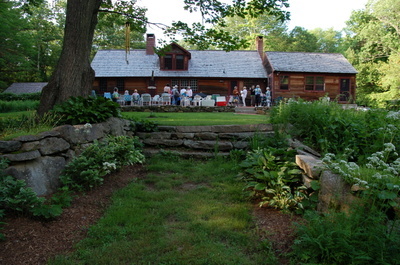 My garden club had its' annual pot luck dinner last night and Sue, one of our members, hosted the party at her very New England home. 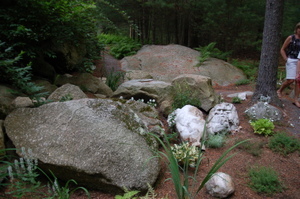 Beautiful gardens, lovely people and rocks everywhere! Not just the kind of rocks that you find in my garden which are heaving their shoulders out of the ground with no hope of release. No, big boulders, big steps, stone walkways, and stone walls. Could this be anywhere else but New England? Well, probably but I haven't yet been there. This spells home to me. 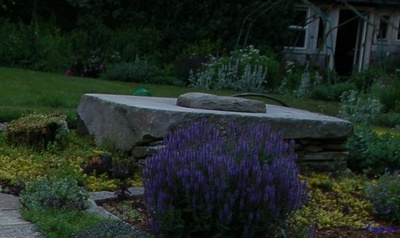 Here is the walkway which is bordered by many interesting plants such as sedums and sempervirens and look at that huge stone well head just beyond the purple salvia. I wonder how much that weighs? I'm not sure if I am leaning or it is leaning. I might have had a glass of wine or two. 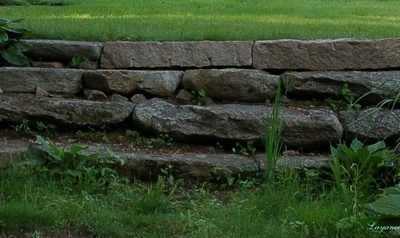 Steps are so inviting especially when made from natural materials don't you think? The borders are pretty lush right now and these lead to the 'Summer House' where many treats were laid out on the tables. 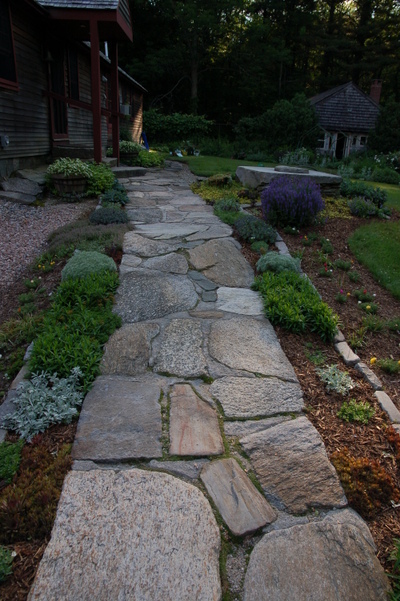 On the other side of the stone path the border rounds out and stretches to the lawn. A very inviting entrance to a wonderful feast! I particularly loved Sue's 'still' behind the barn. I teased her about this but this is actually a water tank which collects the rainwater off the roof of the barn and which is used to water the vegetable garden. A great barn with an ingenious water tank! 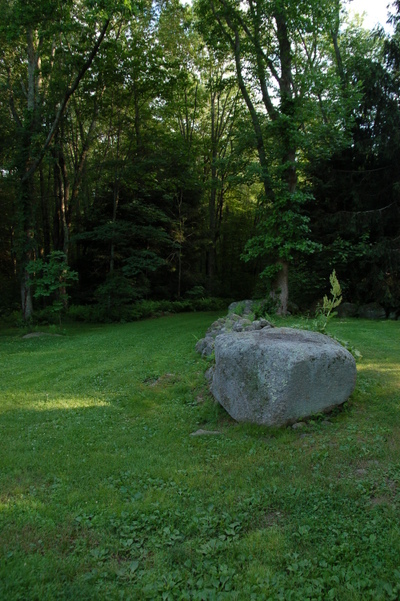 Check out the rock foundation of the barn. 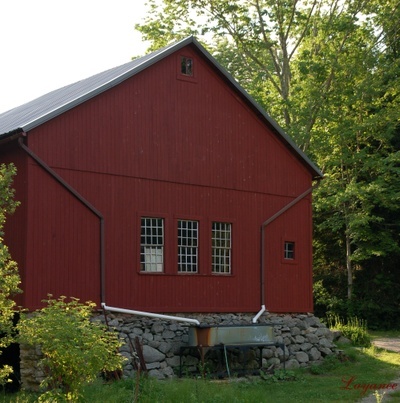 The vegetable garden is behind me as I took this picture of the barn. It is carved out of the field which necessitates a fence to keep out the deer, woodchucks, rabbits, etc. 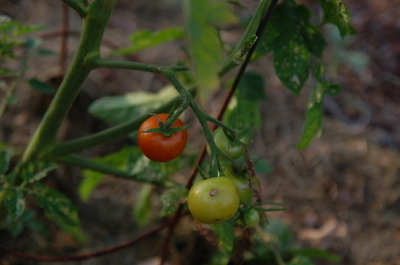 In the garden I found self sown lettuce, spinach and a tomato all ready to pick. I was very tempted but since there was just one red one, I resisted! 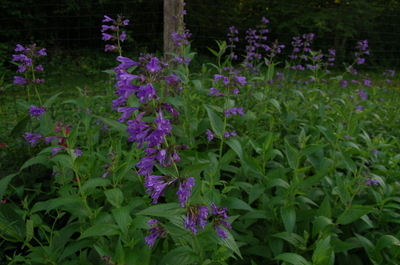 I also extracted a promise of a piece of this nepeta which is about four feet tall with these luscious blue blooms. It is a beauty isn't it? What a nice way to spend an evening. Thank you Susan. This past week I stopped in to visit Kris at Blithewold. She was out and about with the hose as it has been very dry. I didn't see or speak with her but the work she and Gail and the rest of the Blithewold crew have done this summer is beautifully evident. 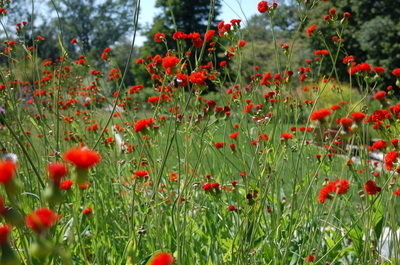 Here are just a few pictures of the colorful and interesting gardens at Blithewold. 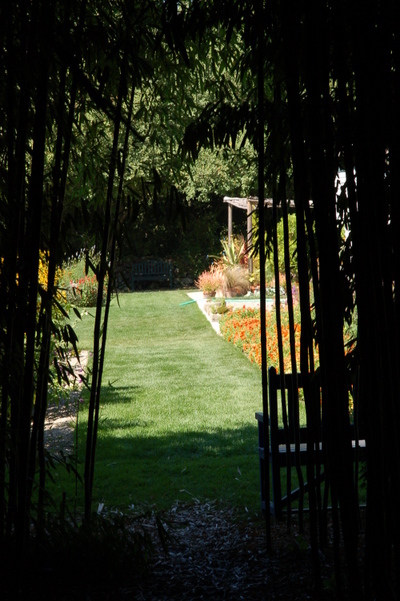 Looking at the gardens through the bamboo jungle is a treat. It is so cool walking along this path with the bamboo on each side and then the brightness up ahead pulls you forward into the gardens. The new garden art adds a punctuation point to the garden don't you think? that Kris posted a picture of on Friday. 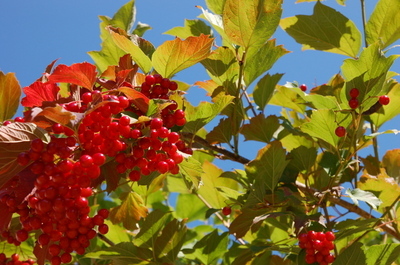 This last picture is of the Viburnum opulus, European cranberry bush, which is living up to its' fruity name. The grounds at Blithewold are lovingly tended, well kept and beautiful and strolling along the many paths one can almost imagine living in this enchanted place in the summer when life seems to take pause and one just enjoys the moments as they arrive. Click to enlarge for full effect. 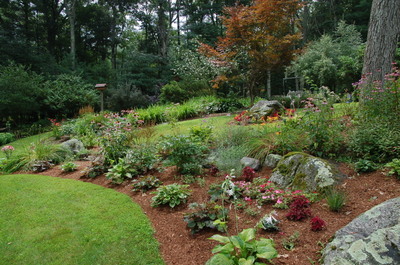 The Native American word, Minnechaug, translates to 'Berry Land', the name of this plant lover's paradise. 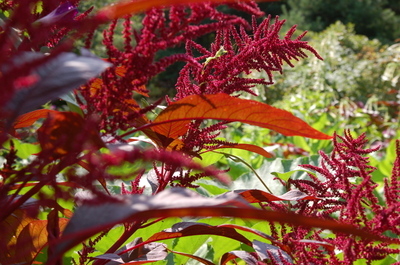 Through a veil of red amaranthus, the garden beyond glows, beckons, and invites you in to share in its' many mysteries. This is a garden which shines at this time of year when many gardens are looking a bit weary. 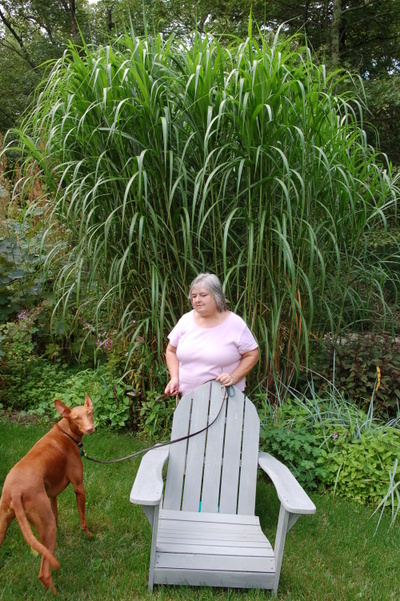 The gardener, Suzanne, and her trusty Pharaoh dog, Zephyr, are pictured here in front of one of the many unusual and mighty grasses within this garden. Zephyr is a dog who is fleet of foot and has keen sense of movement. His head is always turning and he keeps the deer at bay. As you can see, he does look a bit like a deer. This is a picture through the arbor into the garden from the front door and, as you can see, there are interesting plants everywhere not to mention the architecture of the arch. 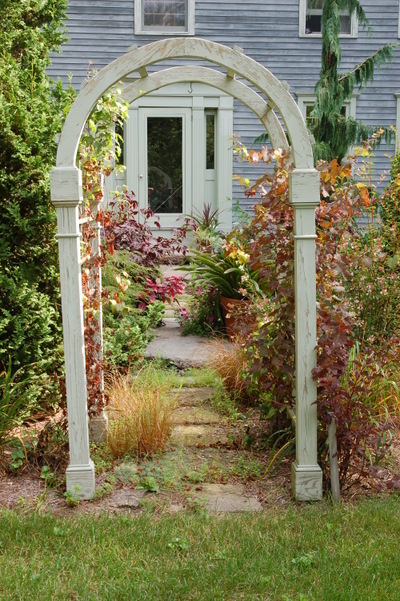 Suzanne's husband is a talented carpenter and his contributions to the garden are clearly evident. Here is a picture looking through the arch from the far side. 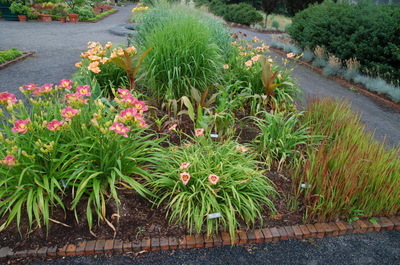 There are many container plantings throughout the garden. 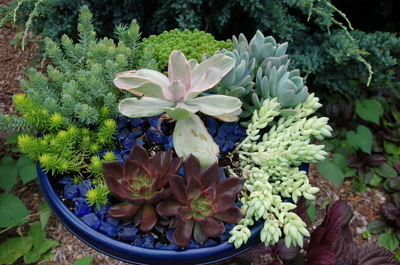 This one is filled with succulents and mulched with blue glass. It is very pretty from above and the effect of the glass causes the garden explorer to stop and take a second look. 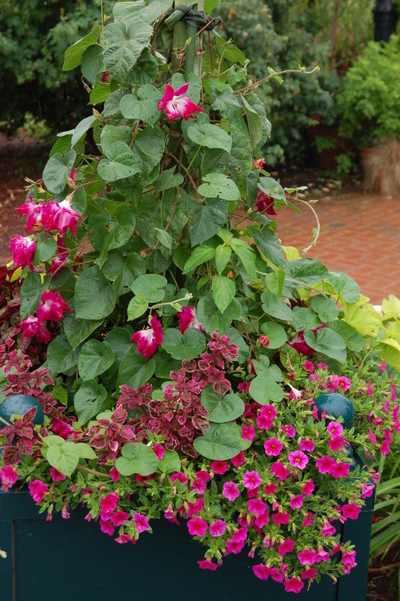 Here is another container filled to the brim with an assortment of annuals. Walking around the arch and down the path toward the back garden there is this bright bit of color at work right on the curve of the lawn. It is a Polygonatum orientale syn. 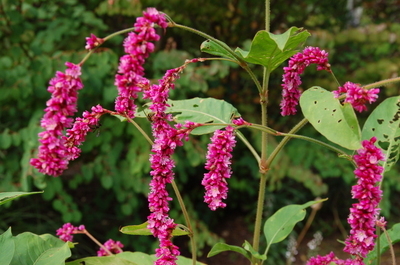 with Persicaria orientalis and it is bright fuschia. Here is a closeup of the flower which is about four and a half feet high. 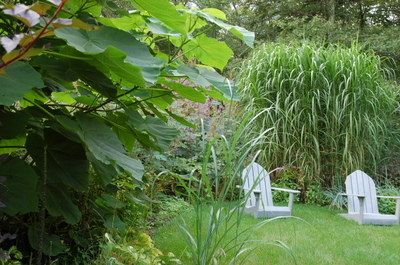 The back garden down by the chairs is home to giant plants. 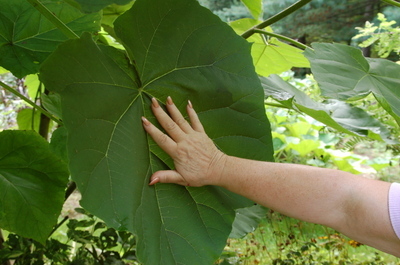 First there is the Paulownia tomentosa which is visible on the left side of this picture and is cut back every spring to induce these large leaves. The tree is hardy to zone 5 but the flower buds are much less hardy and in this zone they are usually killed by frost and rarely bloom. These leaves are worth it don't you think? Then there is the Macleaya cordata with the Thalictrum in front of it. They both tower over the garden at a good seven or eight feet tall. 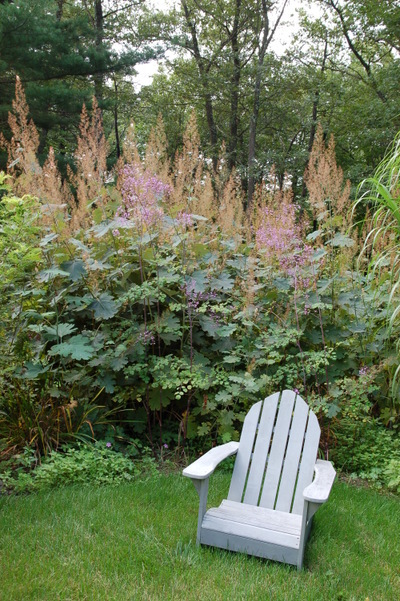 The grass, Miscanthus floridus, behind the other chair completes the feeling of enclosure in this garden space. 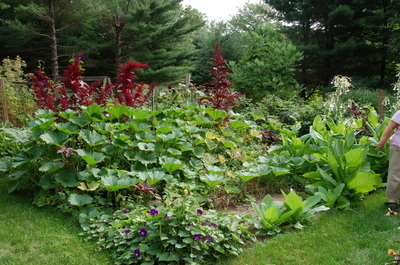 The vegetable garden is ornamental as well as productive. 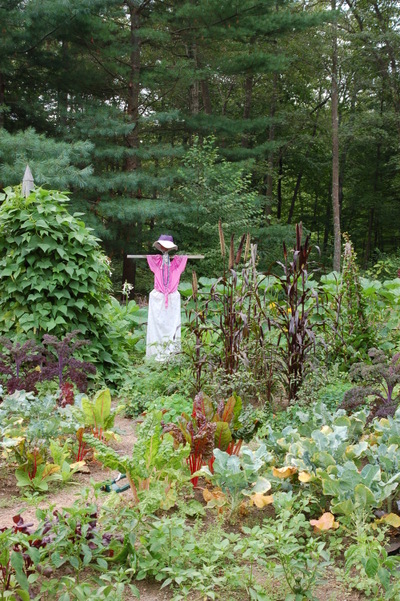 There are vegetables, fruits and 'stick people' of all kinds growing in these spaces. 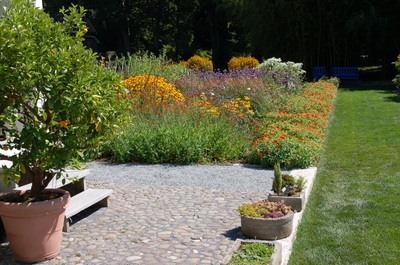 The next garden is the raked gravel garden which I love for its' simplicity yet sophistication. And what garden would be complete without water? 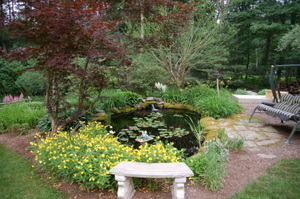 Here is one of two of the water gardens on this property. The lighting would not cooperate for a good pool picture but here are the falls. The sound of water always refreshes the soul! 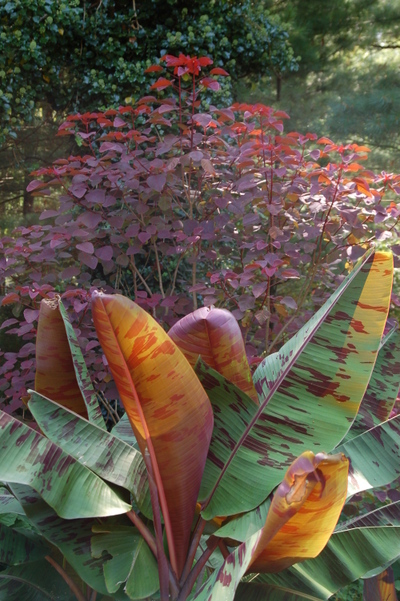 There will be more pictures of plant combinations in future posts but I will leave you with this one of the Cotinus coggyria with the banana tree in front of it. I love the interplay of colors between the two. Thanks to Suzanne and Zephyr for letting me share her garden with all of you! refreshingly energetic. My weekend included a cookout at the home of a friend and colleague. 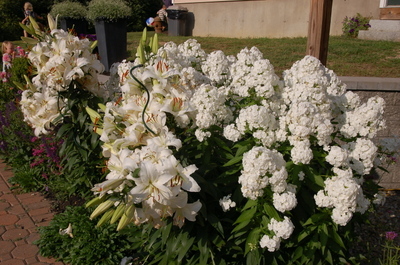 She has planted a white border and a white garden in the back of her home. It was a lovely garden in which to spend an afternoon meeting new friends and sampling the delicious party fare. 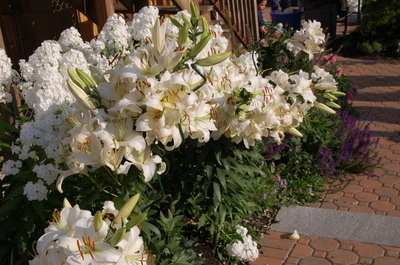 The fragrance of the Casa Blanca lilies permeated the patio area and mingled with the aromas of the barbecue for ultimate sensory satisfaction! 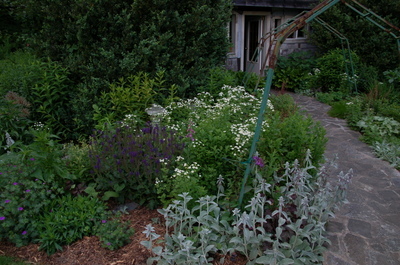 Sitting on the patio or the deck above afforded this view of the white garden at the back of the lawn. 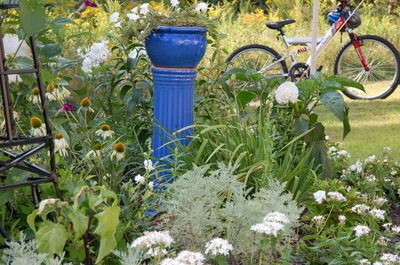 I think the blue pedestal just makes all the white and silver plants look that much brighter. There was a 'bouncy' house in the background for the kids just out of view. They had a great time with that! 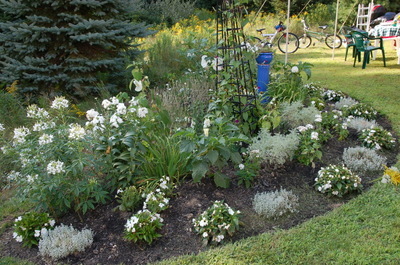 Here is another view of this white garden which includes white cleome, cerastium, pentas, artemisia, new guinea impatiens, datura, Echinacea 'White Swan' and on the tuteur, a Grandpa Ott purple morning glory. Sorry about the bike in the background. 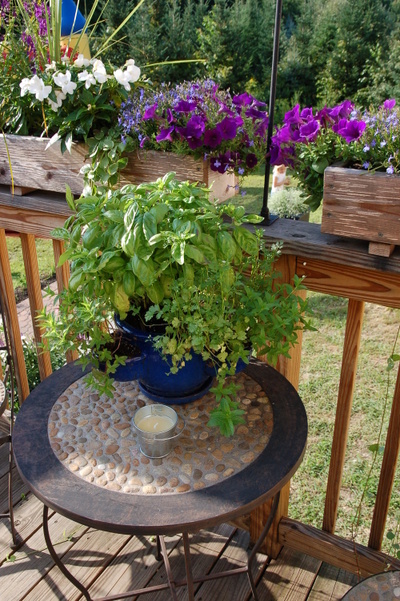 Here is one more shot of this garden and then the nice bistro set with the luscious and overflowing herb jar sitting on the table below these accent window boxes in a white and purple color scheme. 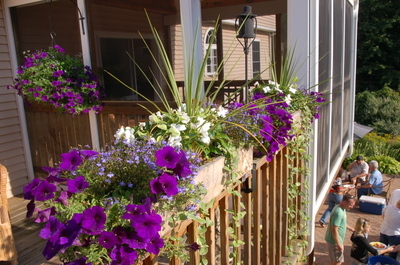 The window boxes contain purple petunias, lobelia, white new guinea impatiens, angelonia and spike plant (dracaena). Oh, and trailing vinca vine. It was a great afternoon in a lovely garden. It really made me think about the effectiveness of a color scheme. What about you? 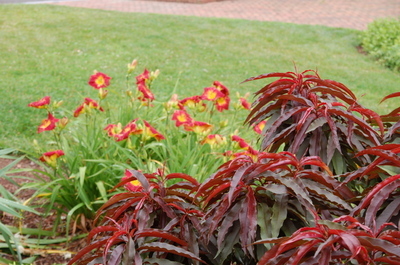 What are your thoughts on color schemes and making them work in your garden? August in the neighbor's garden. and the well head. These stand as sentinels welcoming all to the garden. 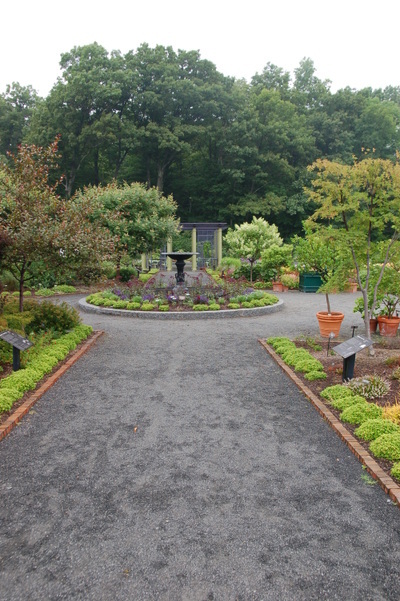 This walkway heads down the hill for this view of the slope garden. I honestly did not see one weed! They have a grounds crew of two. Here is a view looking the other direction at the bottom of the hill. 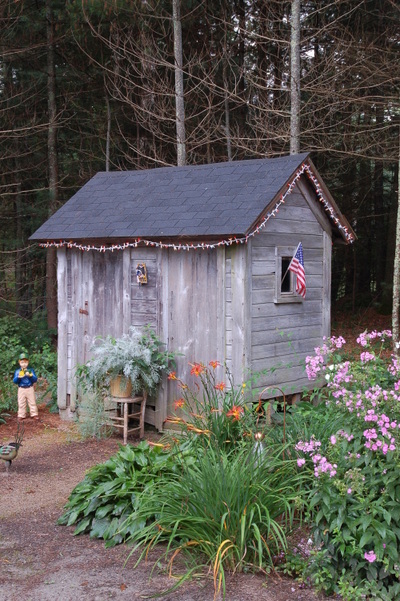 There are many birdhouses throughout the garden which have been crafted by Brenda's Dad. All are unique. One is a replica of the house and another is a copy of a covered bridge in town. 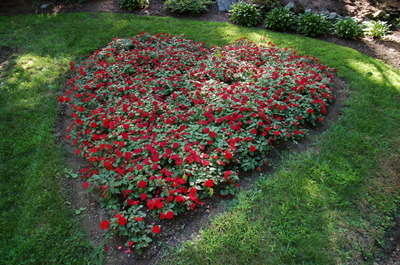 They add to the charm and personalization of the garden. This is one of my favorite gardens of this year. It is the heart garden in almost full glory! The morning glory in the center is not yet blooming but when it does, it will be spectacular! 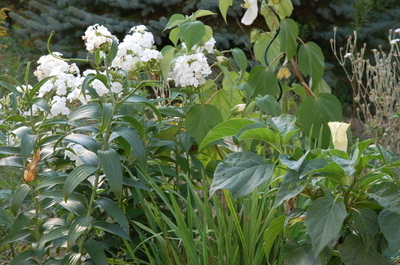 Tucked around the back of the main garden is the white garden and while I did take a picture of it in June, the last time I failed to see the 'Old Man' looking right at me. Can you see him? I did check the previous post and he was there all along! There are many other pictures to post but I think I will save a few views of this garden for a future post. Too much eye candy is hazardous to one's health! 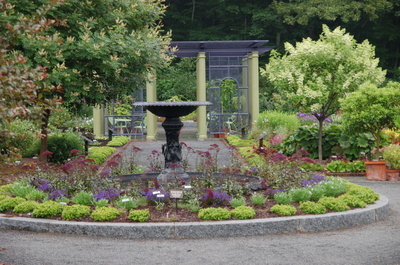 Today I attended an industry (Lawn & Garden) related trade show which was held at Tower Hill Botanical Garden in Boylston, MA. I have written a post about this garden in the past but at this time of year it is a gardener's paradise. It rained intermittently today which made for nice color pictures. 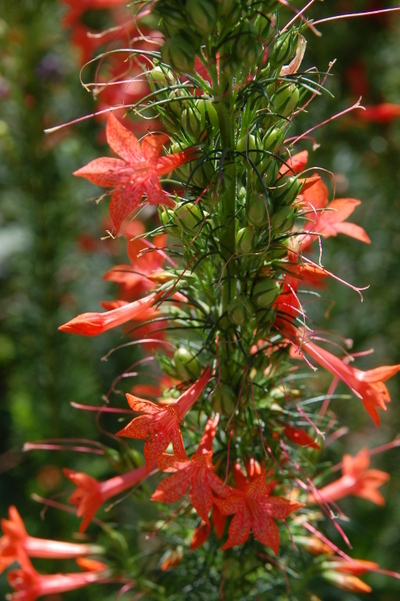 The entry garden which brings you up toward the visitor's center is circular and has some wonderful, unusual plants. This is a Prunus persica 'Bonfire' which is an ornamental peach tree. 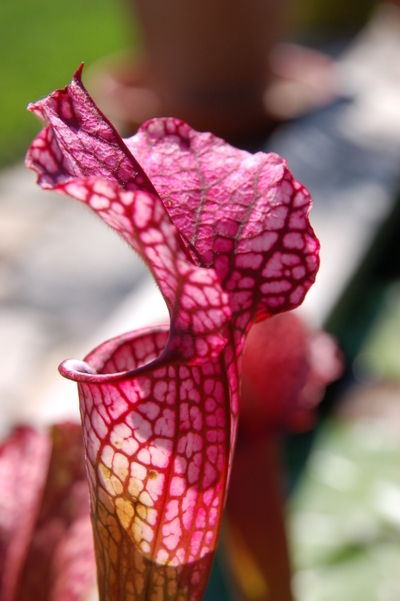 The texture and color are unique and who wouldn't want one in their garden? 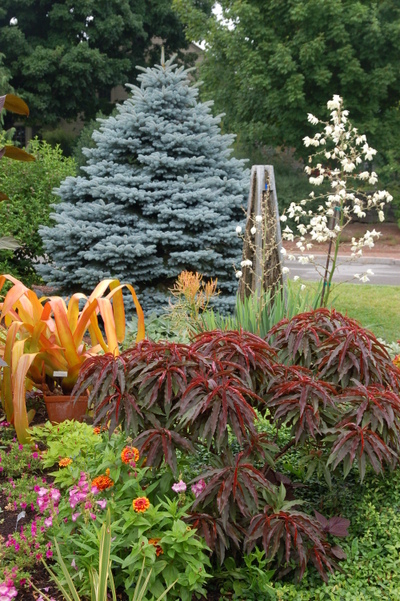 The orange plant in the container is a bromiliad. Here is another view of the peach with a well chosen daylily in the background. 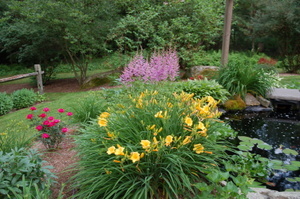 The placement of the blue spruce in the first picture and the matching daylilies in the above picture are just an example of the color planning which goes on here. 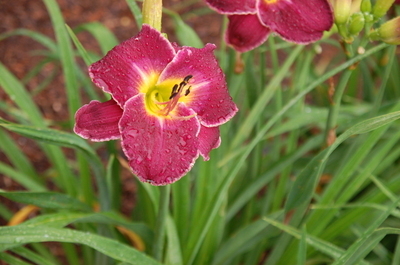 The grounds are full of wonderful daylilies and they are at peak bloom right now. This one is called 'Malmaison Plum'. 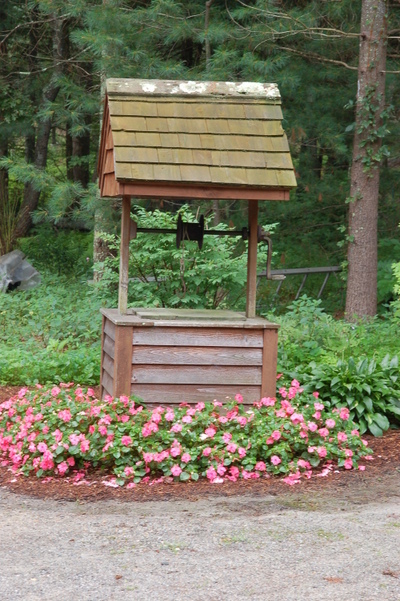 There are interesting planters everywhere on the property and this one flanks the walk in the entry garden. I have not seen this flowering vine but I believe it is a type of morning glory as the leaves are the same. I couldn't find a tag although most plants are labeled. 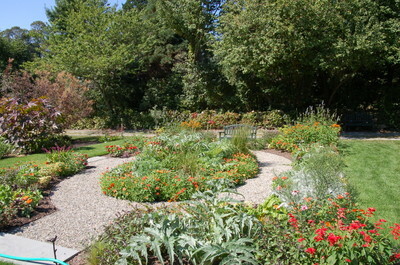 The systematic garden is located behind the orangerie. Here plants are grouped according to their plant family. 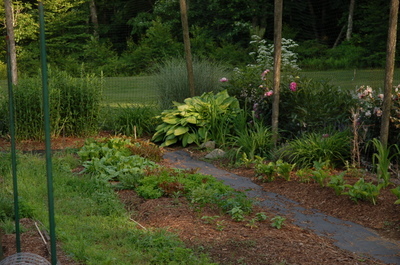 The paths in the garden are wide and easily traversed and there is so much to see one needs a plan to really appreciate the garden. Here is another view of the central structure. 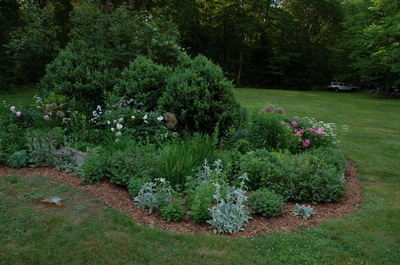 The small lime green border plant is a boxwood. 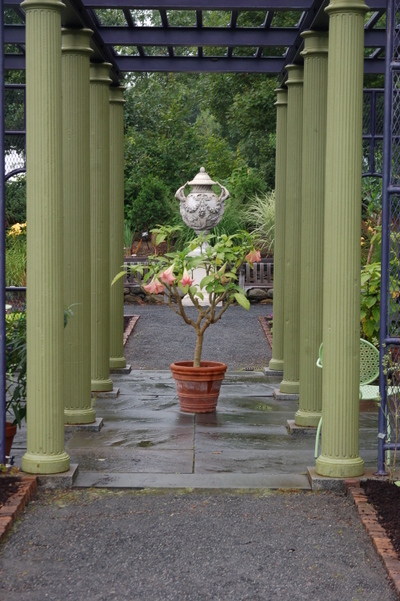 A view from the side looks through to the urn with a well placed brugmansia in the center of the structure. 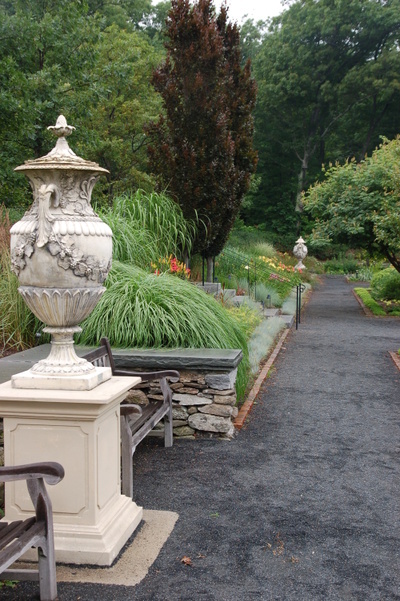 The placement of urns and statuary creates a different view from many directions. 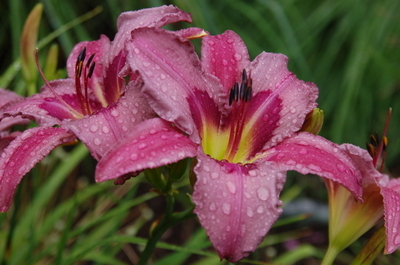 I can't resist showing this daylily named 'Blueberry Breakfast'. It surely looks good enough to eat! 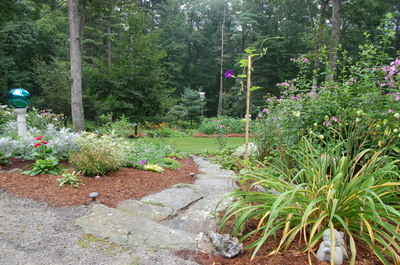 Here are a couple more views of the walkways and the planting beds in the systematic garden. 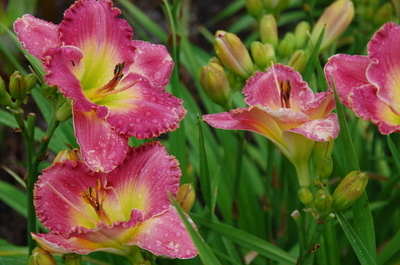 And one more daylily cluster for you daylily afficionados! Tomorrow I will be posting pictures of their very unique vegetable garden. It is time to re-design in the mind for next year! The activity of gardening is a bit different for each of us. 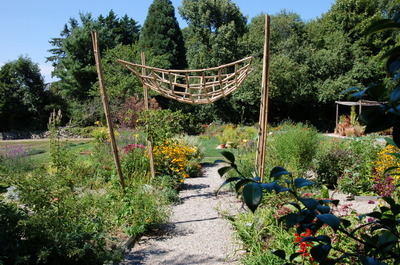 We all have different approaches and different methods which work for us and which make our gardens unique. 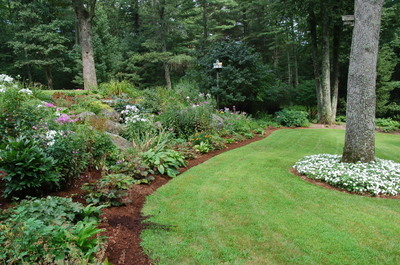 A garden is a reflection of the qualities of the gardener or gardeners working in it. Some are blousy and blooming with wild abandon and others are orderly and precise. I don't look at gardening as a competitive sport. 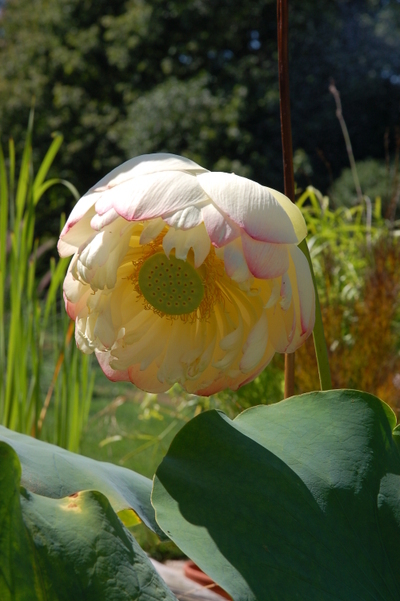 I think that is why it is so easy to appreciate and admire the work of other gardeners and the beauty they create. I am fortunate to live across the road from two wonderful gardeners and good friends. It is an added bonus that I have known Brenda since I was a small child when we played together even before we attended school. Her husband, Rocky, is the brother of my best friend from high school and I spent many an evening at his dinner table enjoying the cameraderie of his family and the wonderful food his Mom prepared. There is such comfort in continuity. 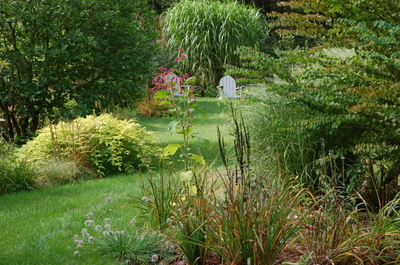 They have a beautiful garden as these pictures so clearly show much more precisely than any words. 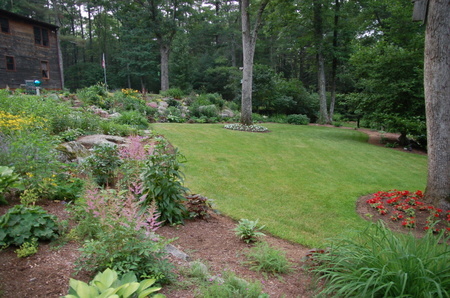 Their garden is on the down side of the slope and mine is on the top of the hill. They have the ledge spilled everywhere as boulders while mine is attached to the earth like the spine of a whale. 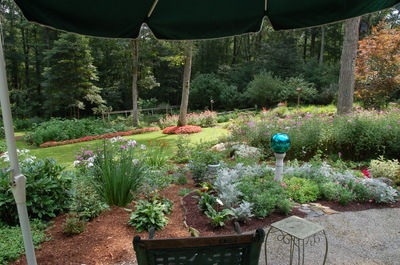 Their garden is a cool, shaded retreat while mine sits up in the sun catching the westerly breeze from the back field. They sit across from each other separated by a gravel road and totally different exposures to wind and sunlight. 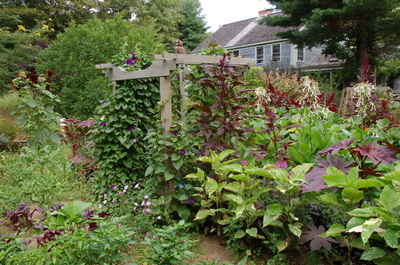 What we share, besides the love of gardening , is the desire and goal to make the best of the properties we are fortunate enough to care take while we are here on earth. They have certainly made the most of theirs. Here is a unique 'historic' building which was moved from its' original location and has changed functions. 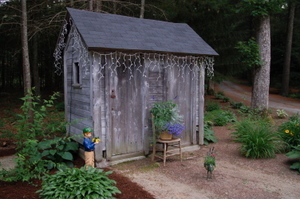 What was once the privy is now the tool shed. 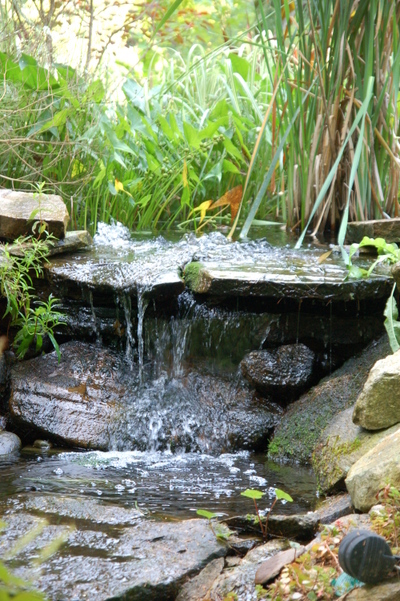 There is a functioning (I say that with a bit of envy) two level fish pond with waterfalls and frogs and fish. 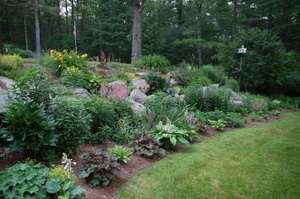 There is a challenging slope which has been planted with a wide assortment of perennials and meticulously cared for as you can see here. In addition, the vegetable gardens produce an abundant amount of peppers and tomatoes and a new herb garden has been installed. 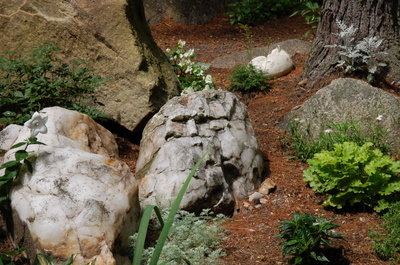 There is even a secret white garden complete with quartz boulders from the site. Tucker got into a bit of a problem with the resident cat...sorry this is a bit blurry but speed was of the essence with this shot, a little genus tension. 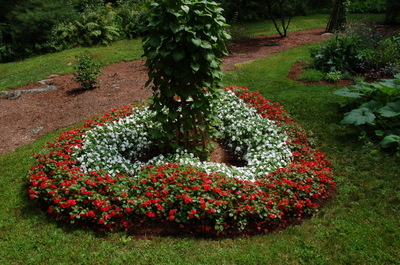 Rocky and Brenda both love annuals and have them bedded out in masses for bright spots of color. 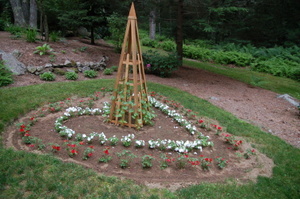 I love this new garden with its' sweet sentiment spelled out in flowers. I can't wait to see it once it has filled in even further. 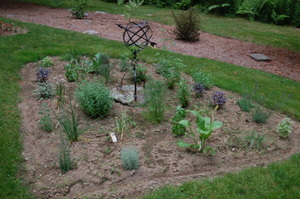 There is much more to see but I will leave you with this one last shot of the gazing globe garden. 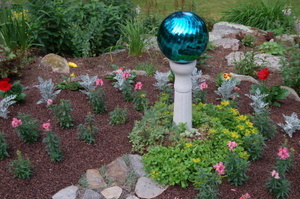 I love the sedum ring around the bottom of the globe stand and the precision of this little portion of the garden. I hope you have enjoyed the tour of this beautiful garden.